LOS ANGELES – The San Jose SaberCats (17-1) wrapped up the regular season with a 60-38 victory over the LA KISS (4-14) on Saturday night. With the win, San Jose tied last season’s Cleveland Gladiators with a 17-1 regular season record, the best mark in Arena Football League history for the 18 game format. 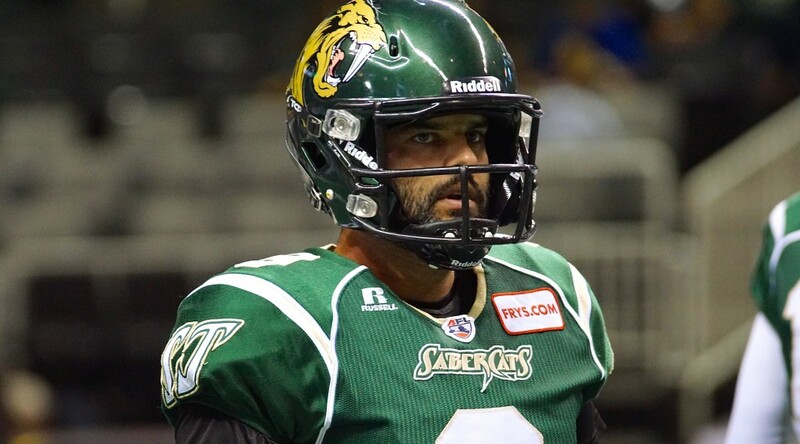 The SaberCats outscored the KISS 23-7 in the second half and Maurice Purify scored the first five touchdowns for the SaberCats, including two from quarterback Erik Meyer. Meyer finished with 120 yards and two touchdowns on 7-of-10 passes. Purify paced the SaberCats with six touchdowns total, three rushing and three receiving, while adding 87 yards receiving. Getting out to an early 21-6 lead the SaberCats seemed in control; however, LA outscored San Jose 19-7 to pull within three points at 28-25. Replacing Meyer in the second quarter, the SaberCats continued to pounce with quarterback Nathan Stanley connected with Purify on a 14-yard touchdown with less than a minute remaining in the second half as the lead swelled back to 35-25. Stanley finished the game by completing 13-of-24 passes for 175 yards and two touchdowns in relief. Regaining possession, the KISS scored on a Joe Clancy 10-yard pass to Dorgan Morgan, his third of the first half. LA Kicker Andre Heidari’s PAT kick was blocked and returned by David Hyland, awarding San Jose two points and a 37-31 halftime advantage. Clancy finished with 261 passing yards and six total touchdowns, but also had two interceptions. LA opened the second half with possession but Francis Maka was able to recover a fumble forced by Donte Paige-Moss on a run by LA FB Hamani Stevens, as San Jose regained possession. The turnover set up the SaberCats for a nine-play drive, capped off with a six-yard touchdown run by Purify, giving San Jose a 44-31 lead. In the fourth quarter, San Jose scored on a deep, 43-yard touchdown pas from Stanley to D.J. Stephens, yet the KISS would answer with a 44-yard bomb from Clancy to Morgan, cutting San Jose’s lead to 53-38 with 10:52 remaining in the game. Morgan finished with seven receptions for 145 yards and four touchdowns, passing 2,000 yards receiving for the season as well. Stephens led the SaberCats with 97 yards receiving on five receptions. The opportunistic SaberCats defense would capitalize when Hyland grabbed an interception for the second straight week, this time taking it back for a 47-yard touchdown, extending the lead to 60-38 with five minutes remaining in the game. Hyland also led the SaberCats with seven tackles, while KISS defensive back Shaine Boyle led all defenders with nine tackles. In his first start of the season, defensive back Kenny Okoro sealed the victory for San Jose, intercepting a Clancy pass with two minutes remaining. Also making his first start of the season, defensive end Chris McAllister recorded his first sack as a SaberCat on a safety with Maka also credited on the sack of Clancy in the fourth quarter. The SaberCats roll into the playoffs with home field advantage and will host the first round of the National Conference playoffs at the SAP Center on Friday, August 14th at 7:30 pm PDT. 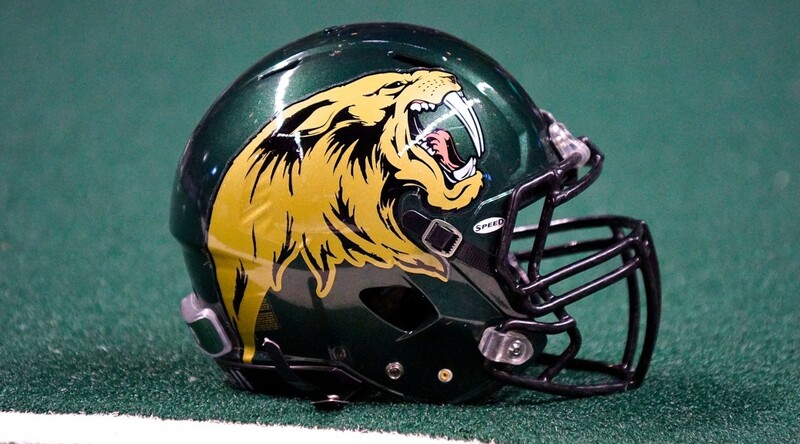 SAN JOSE, Calif.– The San Jose SaberCats (10-0, 3-0) head into week 11 unbeaten and will host Pacific Division foe, the Spokane Shock (3-6, 0-2) at the SAP Center on Friday, June 5th with kickoff at 7:30PM PDT. San Jose is coming off a 61-42 victory over the Portland Thunder, improving to 3-0 in the Pacific Division; while Spokane lost a heartbreaking game against the Arizona Rattlers, 59-47 after tying the game with less than two minutes remaining. In the previous meeting between these two teams three weeks ago, the SaberCats were led by quarterback Nathan Stanley, who threw for eight touchdowns and added another on the ground in an 83-28 lopsided win in Spokane. 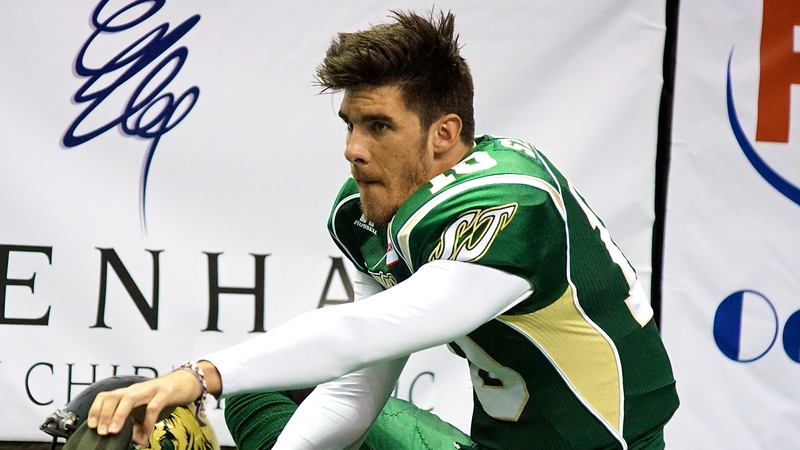 After returning to the starting lineup from an injury, quarterback Erik Meyer has thrown 16 touchdowns over the past two games and ranks fourth in the Arena Football League with 49 touchdowns on the season. 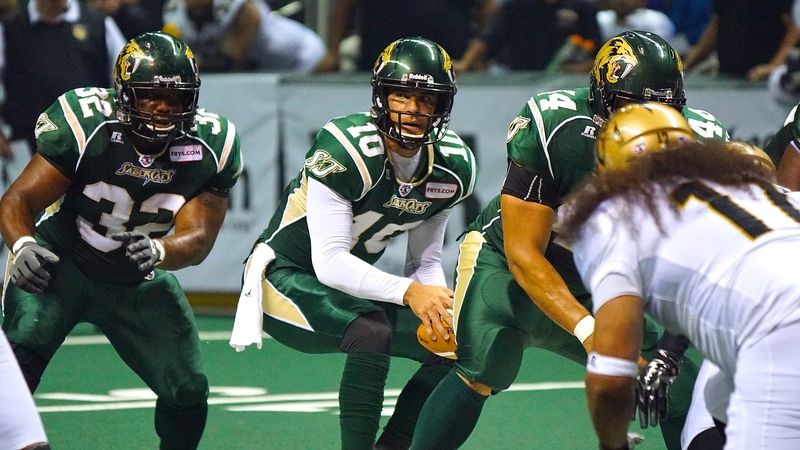 With the 2013 AFL Most Valuable Player settling into a grove under center, the SaberCats’ offense ranks first in the AFL, scoring an average of 61.2 points per game. The game against the Shock will be the first time Meyer squares off against his former team, where he spent the first five years of his AFL career. The leading man for San Jose receivers this season has been wide receiver Reggie Gray. Over the past two outings, Gray has totaled a combined 338 receiving yards, posting five touchdowns in each game. 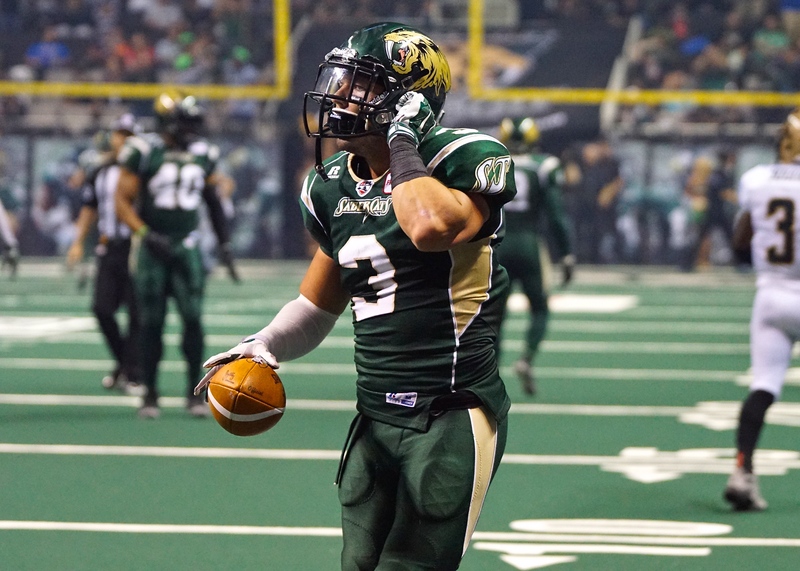 Gray currently leads the AFL, with 24 receiving touchdowns and has also returned three kickoffs for a touchdown. 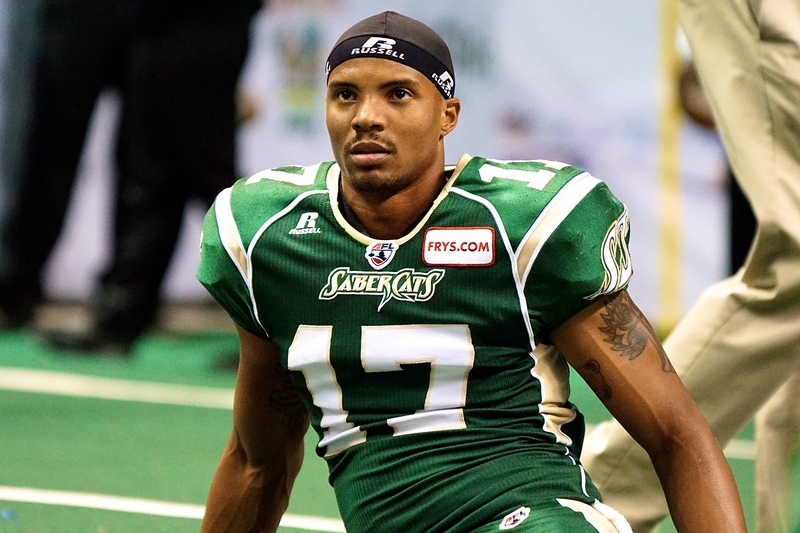 The SaberCats’ can attribute much of their offensive output to the playmaking ability of “Big Play” Reggie Gray. Gray and the rest of the SaberCats’ receivers will have an opportunity to put up another great performance against Spokane’s defense. Not to be overlooked, the San Jose defense also leads the AFL, surrendering just 37.9 points per game. Leading the Arena Football League with nine interceptions and 72 tackles in 2015, defensive back Ken Fontenette had his best game of the season against Spokane in week eight. Fontenette intercepted Shock quarterback Warren Smith on three occasions, returning one for a 16-yard interception. Coming off of his best performance of the season for the Shock last week against the Rattlers, wide receiver Samuel Charles was Smith’s favorite target, grabbing 14 receptions for 144 yards and two touchdowns. Anthony Amos and Nick Truesdell also has been a spark for the Shock offense. Amos has 10 touchdowns in eight games and last week against the Rattlers, he totaled 10 receptions for 92 yards. Truesdell (6’7 240), is an extreme mismatch for most teams, specifically in the red zone. Last week, he had had six receptions for 78 yards with four of those going for touchdowns. 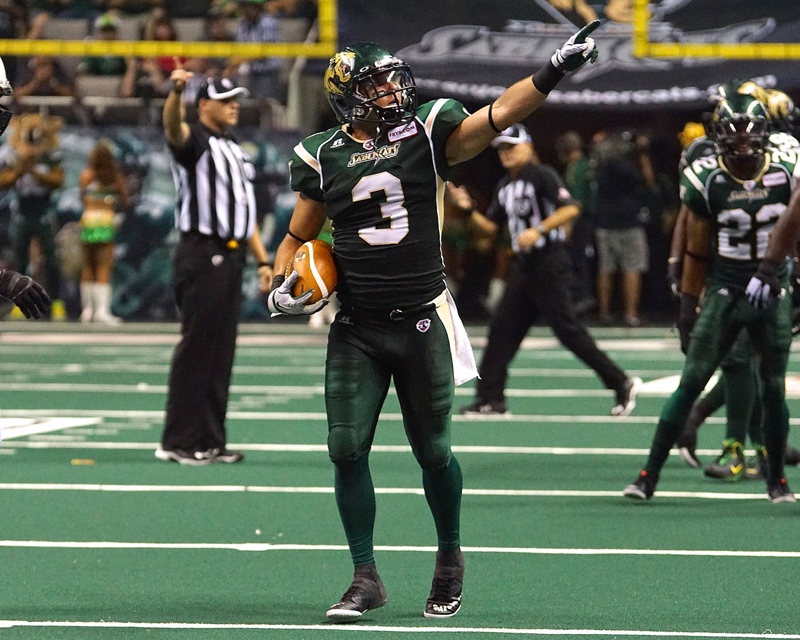 The SaberCats’ league leading secondary will have another litmus test against the Shock receivers. 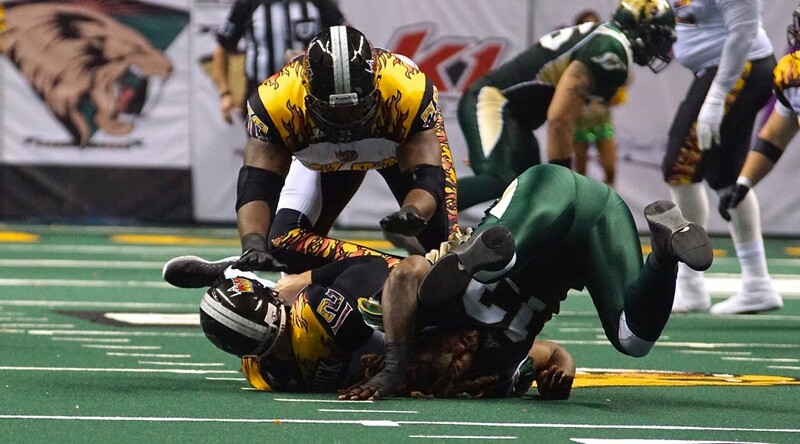 Against San Jose’s ferocious defensive attack, Smith was erratic in his only game against the SaberCats, throwing three interceptions, being sacked four times and was unable to convert on a fourth-down (0-4). 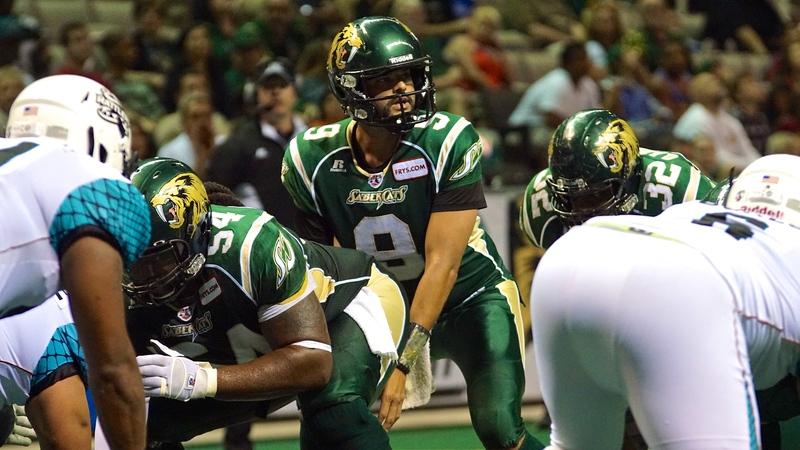 However, Smith, the 2014 Professional Indoor Football League MVP, has thrown for 13 touchdowns in the past two games. Last week against the Arizona Rattlers, Smith threw for 319 yards, rushed for 42 more and had seven total touchdowns, while the Shock were outscored 12-0 in the final minute, after tying Arizona at 47-47. With such a close call last week, expect Spokane to come out strong, as they battle down the stretch for a potential playoff berth. This season, San Jose has won every game by an average margin of 23.3 points per game. After the blowout 83-28 victory over Spokane less than a month ago, the SaberCats cannot rely on their past success, as anything can happen in the indoor war on any given Friday. The game can be found on ESPN3 or heard on KDOW 1220AM radio.